A new batch from Grand Lodge of Ancient, Free and Accepted Masons of North Carolina is now available on DigitalNC! The batch includes more than 40 additions to the North Carolina Memory and Images of North Carolina Collections. Dating from as early as 1778, these items document the rich history of Masonry in North Carolina. Also from this batch, are several materials documenting the construction of several Masonic landmarks in the Raleigh area, including the Masonic Temple (designed with help from Leslie N. Boney, Sr.) and the headquarters on Glenwood Avenue. 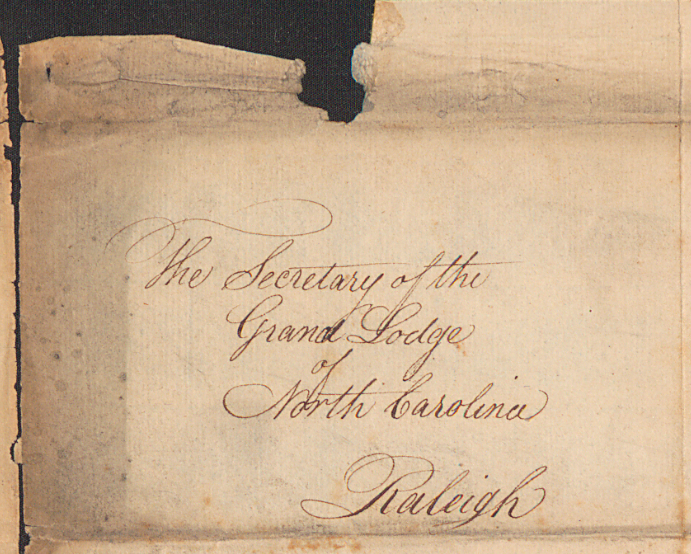 To learn more about the Grand Lodge of Ancient, Free and Accepted Masons of North Carolina, please visit their contributor page or the website. Over 300 new photos from the M.S. 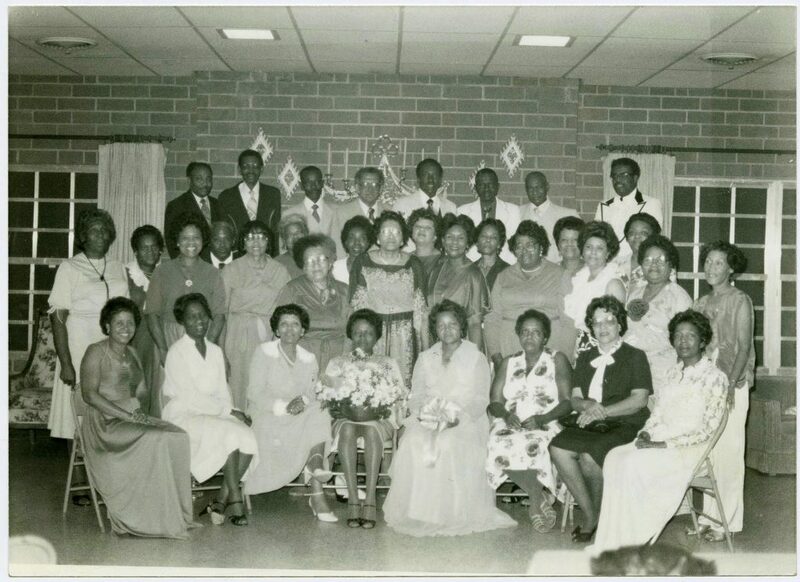 Brown Collection are now on DigitalNC courtesy of the Edgecombe County Memorial Library. M.S. 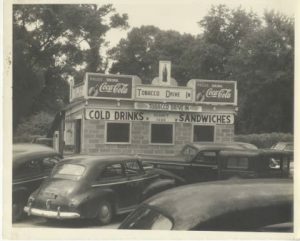 Brown was an avid amateur photographer, and these new additions document a wide variety of aspects of daily life in Tarboro and Edgecombe County. Included are new photographs of Tarboro High School, the Tarboro town clock, businesses in Tarboro, portraits of Tarboro citizens, additions to Edgecombe County Officials, and much more. A folder of M.S. Brown memorabilia is also now available, which includes “The M.S.B. 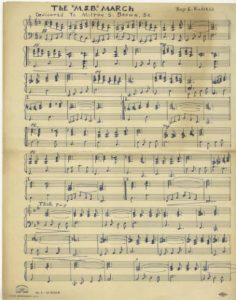 March”, an original piece of music composed by Roy L. Russel and dedicated to M.S. Brown in light of all of his important contributions to the Tarboro community. To learn more about the MS Brown collection, view previous posts about materials digitized from it here. To learn more about Edgecombe County Memorial Library, visit their partner page here. Nearly 30 years of newspapers are now available on DigitalNC courtesy of our partner, the Watauga County Public Library. 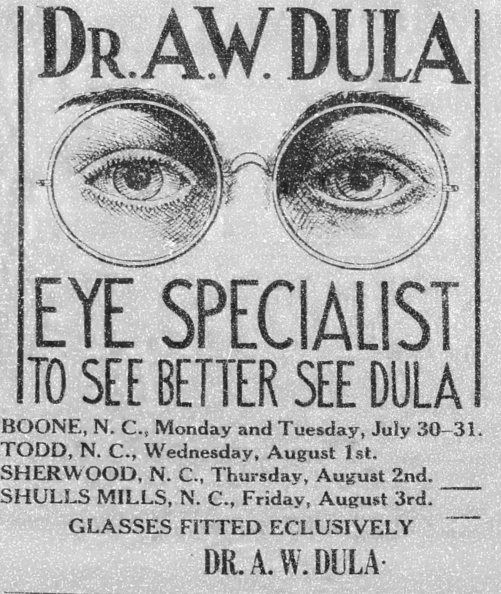 Hailing from Boone N.C., the Watauga Democrat has been serving the Western NC community since 1888 and is still in print today. This batch of newspapers covers several important time periods in NC’s history, including the Depression era and World War II. In addition to local, state, and national news, they offer creative advertisements, many for places Boone residents will recognize, like the Daniel Boone Inn. Newspapers like these could be excellent resources for genealogists interested in the area or teachers looking for primary sources from Boone. To learn more about the Watauga Democrat, check out the about section on their website. You can learn more about the Watauga County Public Library by visiting the contributor page on DigitalNC or by visiting the homepage. To see more community newspapers from many counties in North Carolina, please visit the North Carolina Newspapers Collection. 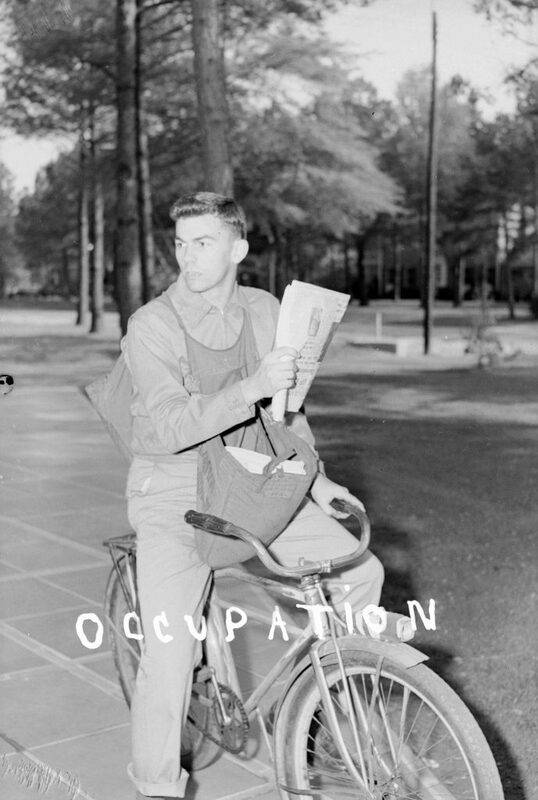 Young Man on Bicycle for Newspaper Delivery, photo by Albert Rabil, April 23, 1951. Courtesy the Braswell Memorial Library. newspapers covering underrepresented regions or communities. Check out our criteria for selecting newspapers, listed below. Verify that the newspaper you’d like to see digitized exists on microfilm. Email us (digitalnc@unc.edu) if you’re not sure. Send us an email with the name of the newspaper you would like to nominate, along with the priority years you’re interested in seeing online. Please talk briefly about how the paper and your institution meet the criteria below. Be prepared to talk with the local rights holder(s) to gain written permission to digitize the paper and share it online. We can give you advice on this part, if needed. Nominations will be taken through the end of 2016. However, don’t wait! We typically get many more requests than we can accommodate. Please contact us at digitalnc@unc.edu or 919-962-4836 with any questions. We’re looking forward to hearing from you. Does the newspaper document traditionally underrepresented regions or communities? Does the newspaper include significant coverage of the local community? Does the newspaper come from an area of the state that has little representation on DigitalNC? Are the images of the pages on microfilm legible, or are there significant sections where it is difficult to read the text? Is the institution willing to obtain permission from the current publisher or rights holder(s) to digitize older issues and make them freely available online? Is there a demonstrated demand for online access to this paper? If the newspaper is digitized, will the nominating library promote the digital project through programs and announcements? In today’s blog post I offer a break from the current election year with a trip back to the 1968 presidential election. Looking at the political landscape of 1968 is like looking at an earlier but familiar view of the same neighborhood we’re in now. It’s issues resonate today: striving for social and racial equality, debates over America’s place on the world stage. The late 60s were boiling with the turmoil of the Civil Rights Era and the Vietnam War. 1968 alone saw the assassination of Dr. Martin Luther King, Jr. in early April and presidential candidate Robert F. Kennedy in June. In April 1968, Time magazine held a mock presidential primary at colleges and universities to take the temperature of young Americans during that election year. Dubbed “CHOICE 68,” the event was covered in many of the student newspapers that can be found on DigitalNC, and I wanted to see what this nation-wide event looked like here in North Carolina. Sample Choice 68 Ballot, printed in Asheville-Biltmore College (now UNCA) newspaper The Ridgerunner, March 1, 1968. Every American college and university was asked to participate in CHOICE 68. The event was governed by a group of eleven students representing a variety of campuses around the country. Campus groups were in charge of publicizing the event with their peers, under the direction of a campus coordinator. 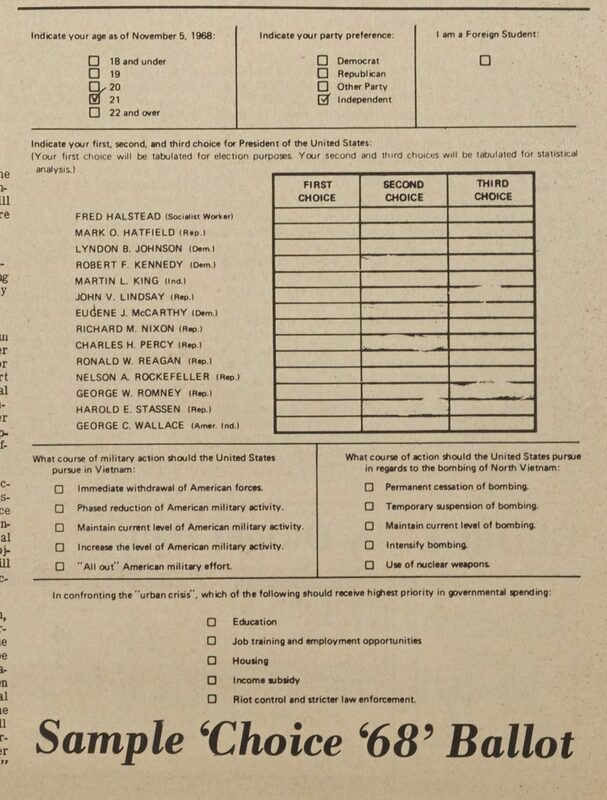 Each ballot (an early draft is shown at right) asked students to rank their top three choices for president and also asked for them to weigh in on Vietnam and the “urban crisis,” the latter of which referred to pervasive concern over poverty, crime, and general unrest in high population urban environments. Write-in candidates were also allowed. Votes from all campuses were tabulated by a UNIVAC computer in Washington, D.C. and the results were supposedly announced on television, with each school’s individual totals being returned during the first week of May. Before the vote, student newspapers urged their readers to rally against apathy, to prove that young voters could impact the national arena. One Brevard College editorial called on moderates to vote, expressing frustration that liberal and conservative activists had been “hoarding the headlines.” An accompanying editorial talked about the conservatives still being committed to rooting out Communism, revealing lingering echoes of McCarthyism from the late 50s. It predicted a 1968 election win for then Governor of California, Ronald Reagan. Campuses with active student government associations and/or political groups tended to have more events and publicity associated with CHOICE 68. North Carolina Wesleyan College’s student body listened to speeches in support of Senator Eugene McCarthy (D), former Vice President Richard Nixon (R), and current Vice President Hubert Humphrey (D), three of the most prominent contenders in early 1968. Voting booths, borrowed from the City of Rocky Mount, housed students punching out chads of computer cards to cast their votes. 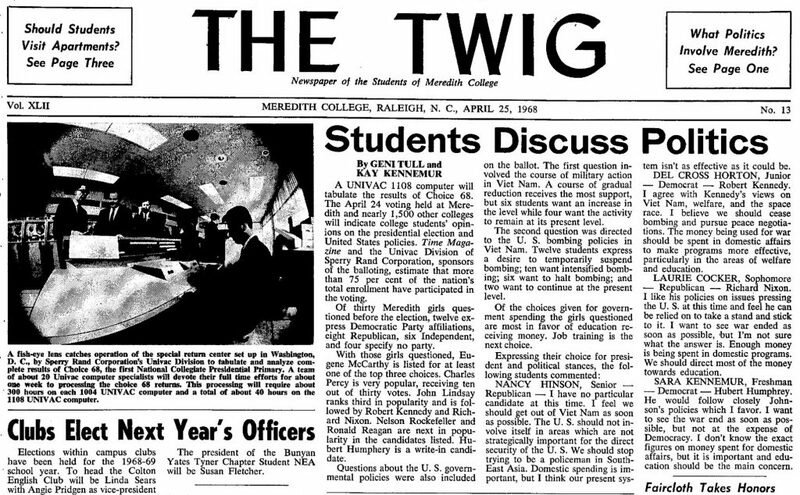 Headline from the April 25, 1968 issue of The Twig, Meredith College. Some schools had hundreds of participants, with 500 Elon students voting in the mock election. Others had fewer; thirty students were questioned at Meredith College. The Twig quoted opinions from four of those 30 (two Republicans and two Democrats) in the issue seen at right. Almost all articles about the vote mentioned the UNIVAC computation of results, which was seen as heralding a new era in which computers could make generating results faster and more secure. The Meredith College Twig published a photo of the computer tabulating results in its April 25 issue (shown above). Dr. Hammer of UNIVAC posited a time when “a huge data bank may contain ‘voice prints’ of eligible voters” to authenticate those phoning in their votes (“A Letter from the Publisher,” Time, May 10, 1968, page 21). Of the North Carolina schools* whose CHOICE 68 results I could locate, McCarthy came out on top for all except North Carolina State University, where Nixon prevailed and McCarthy came in second. Nixon was the second choice for 7 schools, and Nelson Rockefeller (R) carried second choice at the remaining 3. Though he won the CHOICE 68 vote and continued to be bolstered by student support through the primaries, McCarthy was beaten by Humphrey to gain the official Democratic nomination. The November election was won by Nixon, however the CHOICE 68 voters’ preference for a Democratic candidate was somewhat predictive: Humphrey prevailed with voters under 30 in the general election. As far as I can tell, no nationwide poll quite like CHOICE 68 has been held since, though speculation over how college-aged Americans will vote certainly hasn’t changed. 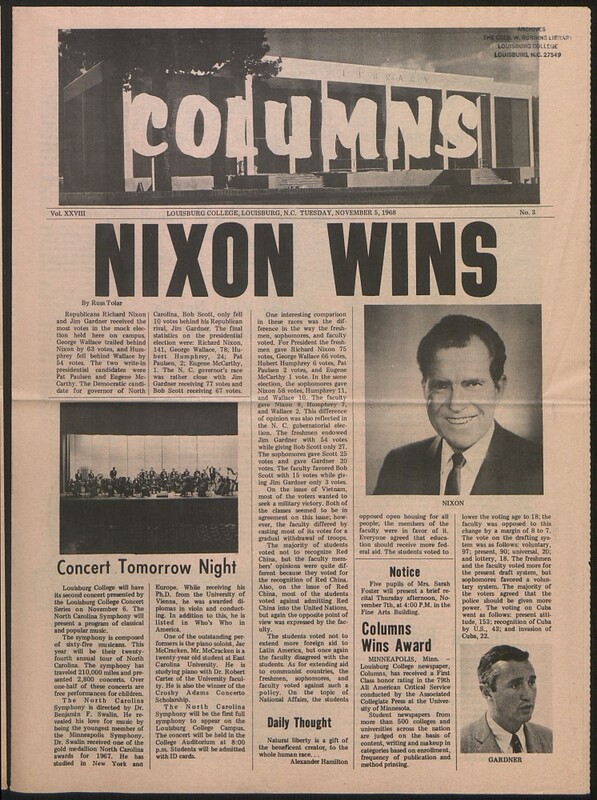 If you’re interested in other historical election news and opinion as reported by student newspapers, visit the North Carolina Newspapers collection. 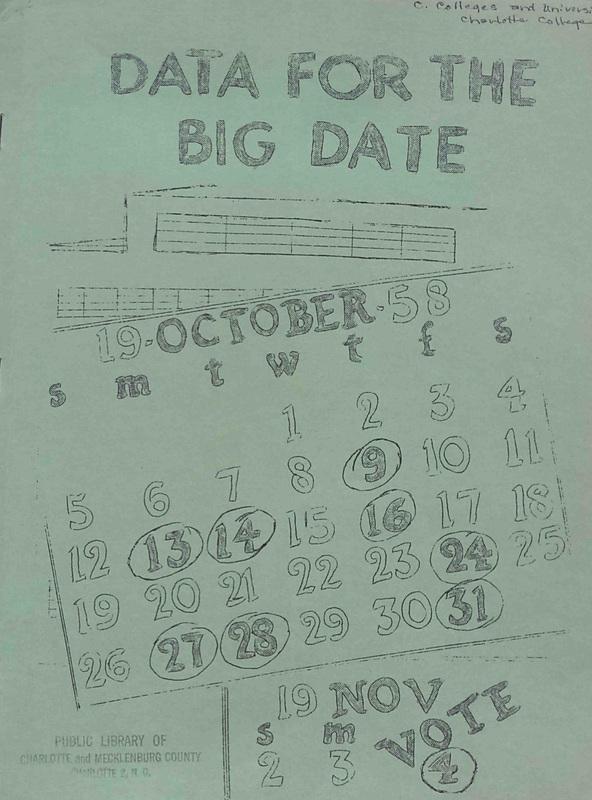 November 5, 1968 issue of the Louisburg College Columns student newspaper. Students picked Nixon in a straw poll held close to the general election. *It appears that the following schools also participated in CHOICE 68 based on mentions in newspapers and yearbooks, but no results were found: Appalachian State University, High Point College, Lees-McRae College, Lenoir-Rhyne College, Queens College, and University of North Carolina at Greensboro. Several new items from Charlotte Mecklenburg Library are now available online. These items tell the story of two Queen City community colleges and the social issues surrounding them– specifically Carver College and Charlotte College. 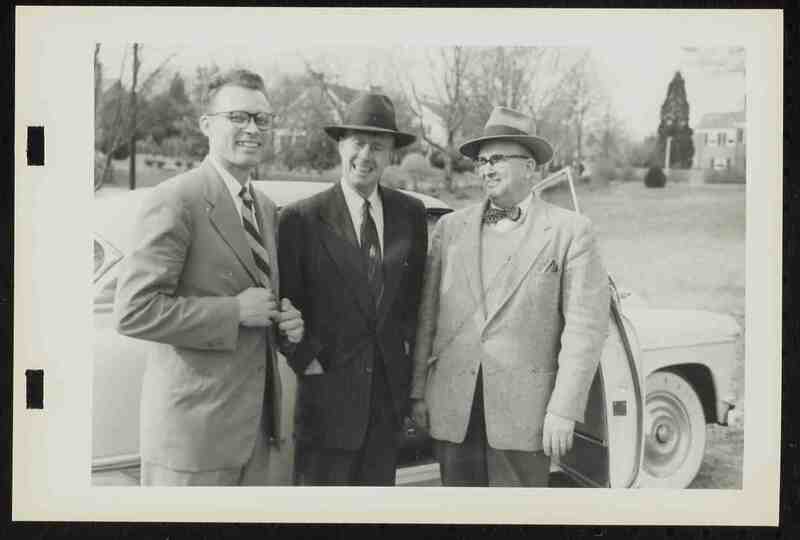 The materials in this batch document the conversation surrounding several bond elections held in Charlotte in the late 1950’s to the early 1960’s. These bond elections centered on a debate about whether Charlotte should have two community colleges– one for white students and one for black students. The report “Should Charlotte Build Two Community Colleges?” summarizes the arguments on both sides and gives a detailed narrative about how various stakeholders in the education community responded to social changes in North Carolina during the 1960’s. 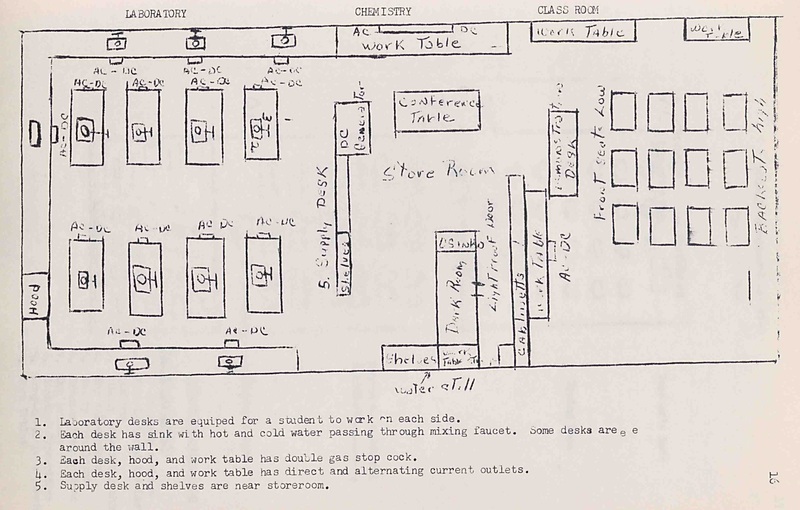 These items could be excellent primary source documents for educators constructing curriculum about the civil rights movement in North Carolina. Should Charlotte Build Two Community Colleges? You can see more information about Carver College by browsing their materials in the North Carolina Yearbooks Collection. You can learn more about the Charlotte Mecklenburg Library by visiting their contributor page or their website. 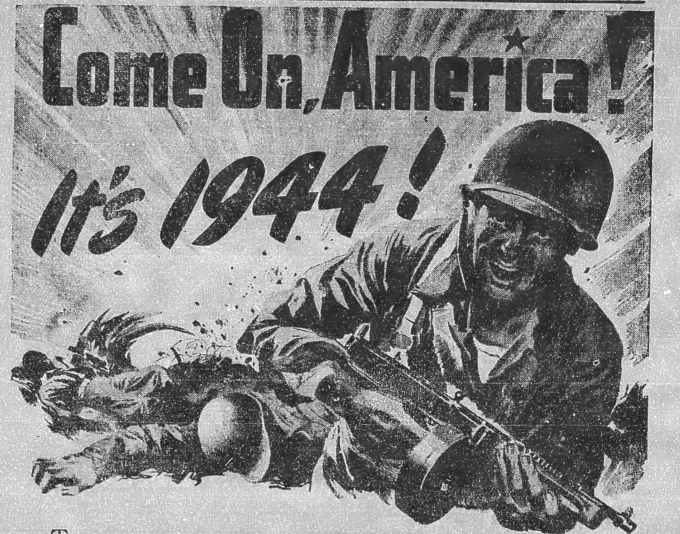 December 8, 1941 issue of the Wilkes Journal-Patriot newspaper. The Wilkes Journal-Patriot, nominated for digitization by the Wilkes County Public Library, is one of our most recently added newspaper titles on DigitalNC. Wilkes county is located in the northwestern part of the state, and the Journal-Patriot comes out of North Wilkesboro, the county seat. With the permission of the Journal-Patriot, we were able to digitize papers spanning 1933-1947. Some of the very first issues headline big national news, like Franklin D. Roosevelt’s inauguration as President of the United States. The paper contains a good bit of local news, covering events held by local clubs, progress in developing businesses, the implementation of social services throughout the county and, of course, crime. The earliest issues frequently discuss prohibition, like officers shutting down local stills or the legalization of 3.2 beer. 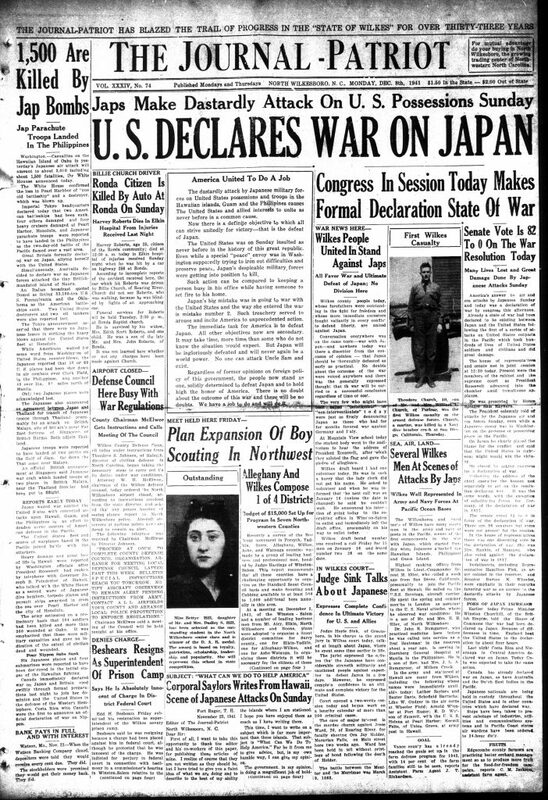 Through the forties, much of the paper is taken up by war news from abroad and at home, describing local sentiment and civilian defense efforts. Sales of war bonds, collections of valuable rubber and other scrap, and other local contributions to winning the war abound. There’s a column entitled “Wilkes Men with the Colors” or “Wilkes Men in Service” that follows local citizens serving in the armed forces. We’re pleased to welcome Wilkes County Public Library, a new partner. You can view more items about Wilkes County on our site, or browse additional newspapers from all parts of the state in the North Carolina Newspapers Collection. May 11, 1940 issue of The Kings Mountain Herald Newspaper. During our last call for newspaper digitization, the Kings Mountain Herald was nominated by Mauney Memorial Library. Issues of the paper from December 1937-December 1954 have now been added to DigitalNC. The Herald, with the byline “Kings Mountain’s RELIABLE Newspaper,” is a mixture of brief national news, local news and events, and local editorials. 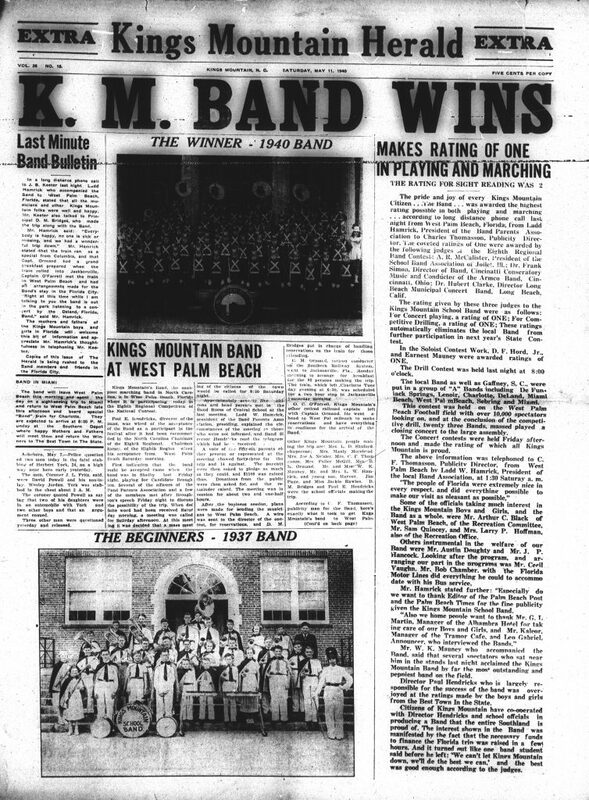 For the relatively small Kings Mountain (the paper’s masthead in December 1954 lists a population of 7,206) the local school band’s success in competition is first page news (see right). Newspapers that focus on items of local news are often the most useful for genealogical research, and getting a sense of what was important to a community 50-100 years ago. You can other items shared by Mauney Memorial Library on their contributor page, and many more items from Kings Mountain on DigitalNC. 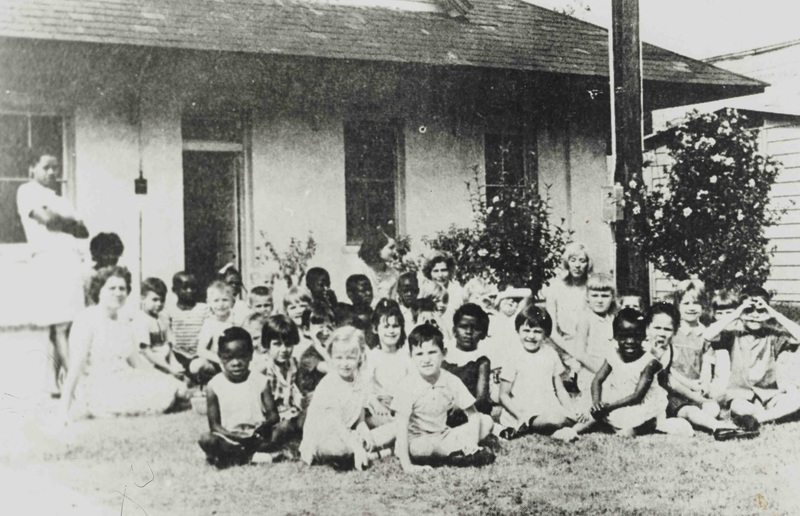 DigitalNC has published more than 700 photos from the Benson Museum of Local History in Johnston County. The photos document various aspects of the Benson community from as early as the mid nineteenth century through the 1990s. 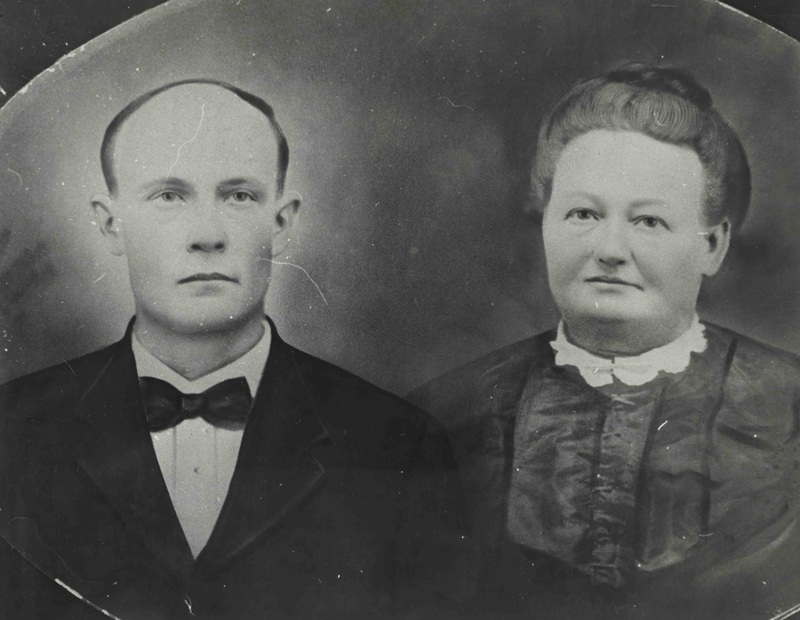 From family portraits to the “Mule Day” celebrations, these photos give a unique look into many aspects of life in Benson across the decades. 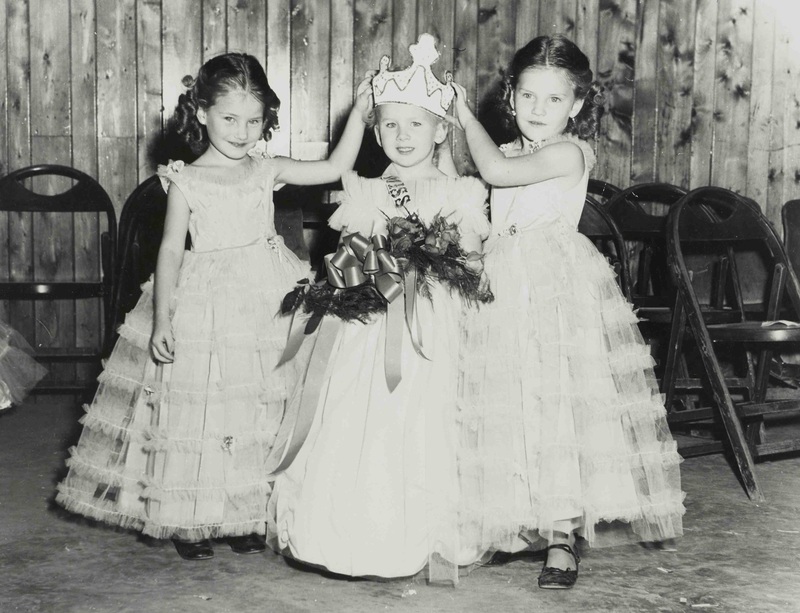 The most recent batch includes photos of little pageant contestants, community awards, family portraits, hog killings, and more. To learn more about the Benson Museum of Local History please visit their contributor page, homepage or the DigitalNC blog. Davie County Training School Reunion (1980s) Courtesy Davie County Public Library. 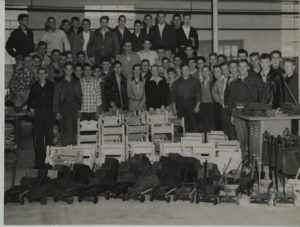 Yearbooks and other types of school memorabilia are some of the most popular types of items we digitize. They bring out nostalgic feelings, in addition to being sources of information about individuals and communities. Some of the most prolific preservers of school memorabilia are High School Alumni Associations, and we’re pleased to announce that the Digital Heritage Center will now work with them to help share their collections online. For the last 6 years, the Digital Heritage Center has served cultural heritage institutions throughout North Carolina. While many Alumni Associations may not have a brick and mortar presence, they are often entities with long histories and an active and coordinated membership. We are looking forward to helping them share their history online, along with the libraries, archives, museums and other institutions we currently partner with. operate with some sort of governance structure. If you’re part of an Alumni Association and are interested in becoming a partner, please read about how to participate and get in touch with us. We’d love to hear from you! 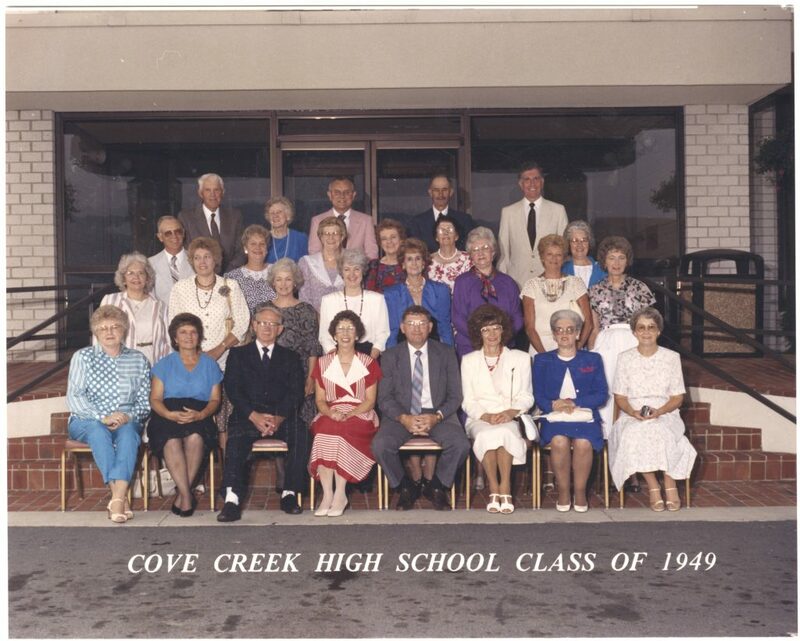 Cove Creek High School Class of 1949 Reunion (1997) Courtesy Watauga County Public Library.